A cooling tower is a heat rejection device, which extracts waste heat to the atmosphere though the cooling of a water stream to a lower temperature. The type of heat rejection in a cooling tower is termed “evaporative” in that it allows a small portion of the water being cooled to evaporate into a moving air stream to provide significant cooling to the rest of that water stream. The heat from the water stream transferred to the air stream raises the air’s temperature and its relative humidity to 100%, and this air is discharged to the atmosphere. 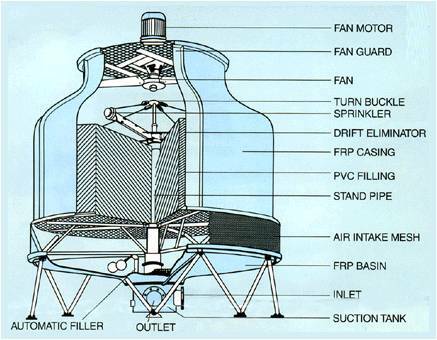 Evaporative heat rejection devices such as cooling towers are commonly used to provide significantly lower water temperatures than achievable with “air cooled” or “dry” heat rejection devices, like the radiator in a car, thereby achieving more cost-effective and energy efficient operation of systems in need of cooling. Common applications for cooling towers are providing cooled water for air-conditioning, manufacturing and electric power generation. The smallest cooling towers are designed to handle water streams of only a few gallons of water per minute supplied in small pipes like those might see in a residence, while the largest cool hundreds of thousands of gallons per minute supplied in pipes as much as 15 feet (about 5 meters) in diameter on a large power plant. A cooling tower is an enclosed structure with internal means to distribute the warm water fed to it over a labyrinth-like packing or “fill.” The fill provides a vastly expanded air-water interface for heating of the air and evaporation to take place. The water is cooled as it descends through the fill by gravity while in direct contact with air that passes over it. The cooled water is then collected in a cold water basin below the fill from which it is pumped back through the process to absorb more heat. The heated and moisture laden air leaving the fill is discharged to the atmosphere at a point remote enough from the air inlets to prevent its being drawn back into the cooling tower. The fill may consist of multiple, mainly vertical, wetted surfaces upon which a thin film of water spreads (film fill), or several levels of horizontal splash elements which create a cascade of many small droplets that have a large combined surface area (splash fill). In a counter-flow cooling tower air travels upward through the fill opposite to the downward motion of the water. In a cross-flow cooling tower, air moves horizontally through the fill as the water moves downward. Cooling towers are also characterized by the means by which air is moved. Mechanical-draft cooling towers rely on power-driven fans to draw or force the air through the tower. 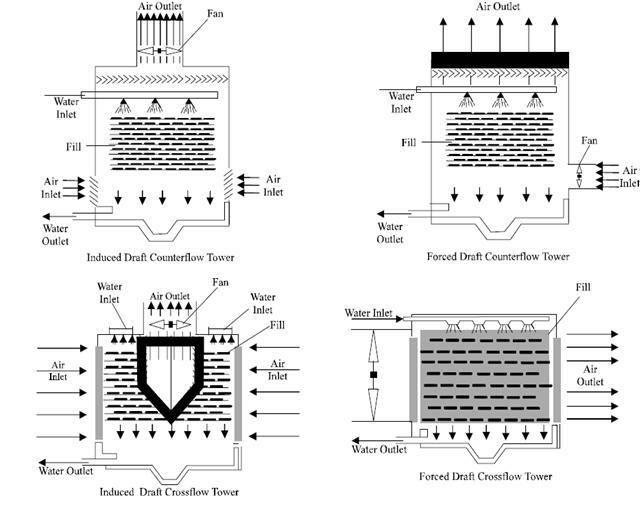 A fan-assisted natural-draft cooling tower employs mechanical draft to augment the buoyancy effect. In modern cooling towers schemes employed for air movement are depicted below. If cooled water is returned from the cooling tower to be reused, some water must be added to replace, or make-up, the portion of the flow that evaporates. Because evaporation consists of pure water, the concentration of dissolved minerals and other solids in circulating water will tend to increase unless some means of dissolved-solids control, such as blow-down, is provided. Some water is also lost by droplets being carried out with the exhaust air (drift), but this is typically reduced to a very small amount by installing baffle-like devices, called drift eliminators, to collect the droplets. The make-up amount must equal the total of the evaporation, blow-down, drift, and other water losses such as wind blowout and leakage, to maintain a steady water level. In large cooling Towers chemicals like Corrosion Inhibitor, Biocide & Bio-dispersant are also added depending upon the application & water chemistry & metallurgy. 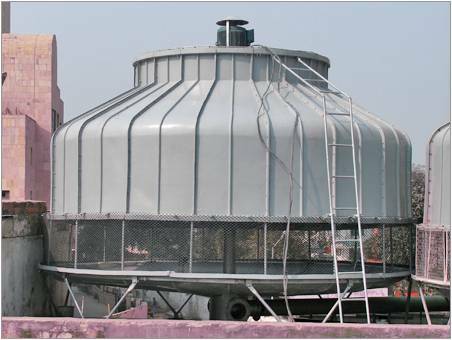 A part of cooling water stream is continuously filtered to provide the clean cooling water to the tower so that the fill material is not clogged by suspended matter. Such Filter is called Side Stream Filter.